The set of vertical bearings will be used in a large pulse power supply generator for the Korean Super Conducting Tokama Advanced Research (KSTAR) project, aimed at finding a way to generate low cost electricity from nuclear fusion. In August 2010, an English motor manufacturer contacted Kingsbury to ask for our help in designing and supplying a set of vertical bearings for use on a large pulse power supply generator they were building for the National Fusion Research Institute (NRFI) in Daejeon, South Korea. The firm had already provided generators for similar projects in Germany and the United Kingdom, and it was due to their experience that they were chosen for the Korean project, which goes by the acronym KSTAR (Korean Superconducting Tokamak Advanced Research). The project's aim is to find a way to produce low-cost electricity from nuclear fusion on a long-term basis. In the upcoming phase of research, the NRFI will increase the plasma pulse from 20 seconds to 300 seconds. 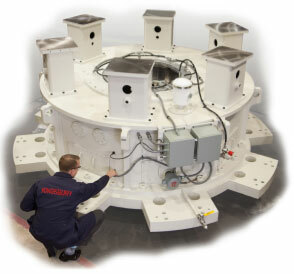 Kingsbury was awarded the order in January 2011 based on a competitive bid and immediately embarked on the detail design work for both the upper and lower bearing assemblies of the generator. Headquartered in Philadelphia, PA USA, Kingsbury designs and manufactures a wide variety of standard and custom fluid-film thrust and journal bearings for rotating equipment applications, including hydroelectric turbines, gas and steam turbines, compressors, gearboxes, pumps, air preheaters and ship propulsion systems. Today, the company maintains its position as the industry leader through continuing research and development, engineering integrity, and world-class customer service.